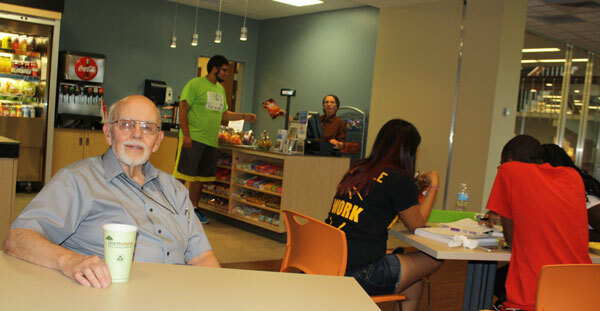 Dr. Wilbur McFadden in Wilbur's, MU's new cafe and study lounge. There’s a new hot spot on campus that is serving up a new tradition of smiles and comfortable learning connections. It’s Wilbur’s, where new generations of Manchester University students are gathering to study, collaborate on projects, tap the rich resources of Funderburg Library and its staff of experts, and sip a cup of Joe. Students also want those personal learning spaces with coffee and other sustenance close at hand, he adds. Now they have it. Chartwell’s campus food service has created a Wilbur’s menu of veggie and fruit snacks, wraps, breads and sweets – including “penny candy.” Students also will find punches, tea, coffee and waters at Wilbur’s, of course. Signs (including a neon sign on the mall window) will go up in a few weeks, with a dedication during Homecoming, at 10 a.m. on Saturday, Oct. 5. At least 19 McFaddens have Manchester in their blood, including Dr. McFadden’s parents – W. Glenn McFadden ’28 and Eva Burkholder ’30x McFadden. Cousins and nieces and others are in the McFadden branches of the MU family tree, and more undoubtedly will sprout. Wilbur’s is part of a $240,000 summer renovation of the library. The Wilbur’s space was a computer laboratory, which moved downstairs, accompanied by more computers and collaboration space for students.